What’s brunch without carbs, eh? For my latest Ladies Who Brunch, I made the Australian Folded Eggs and Smoked Salmon Nicoise, but I wanted one more dish to tie it all together. Serving actual bagels felt like it would be too heavy, but I wanted something carb-y. 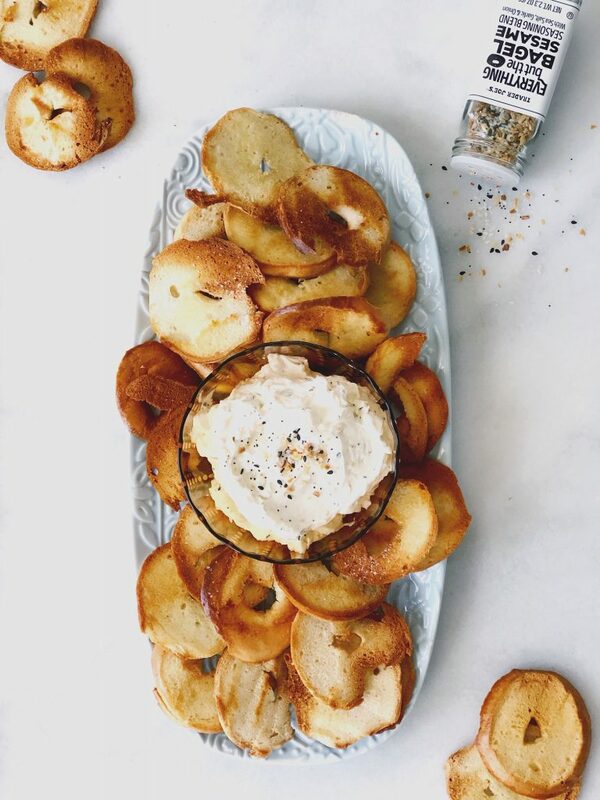 Enter bagel chips & dip: because seriously, who doesn’t love bagels and who doesn’t love dip? 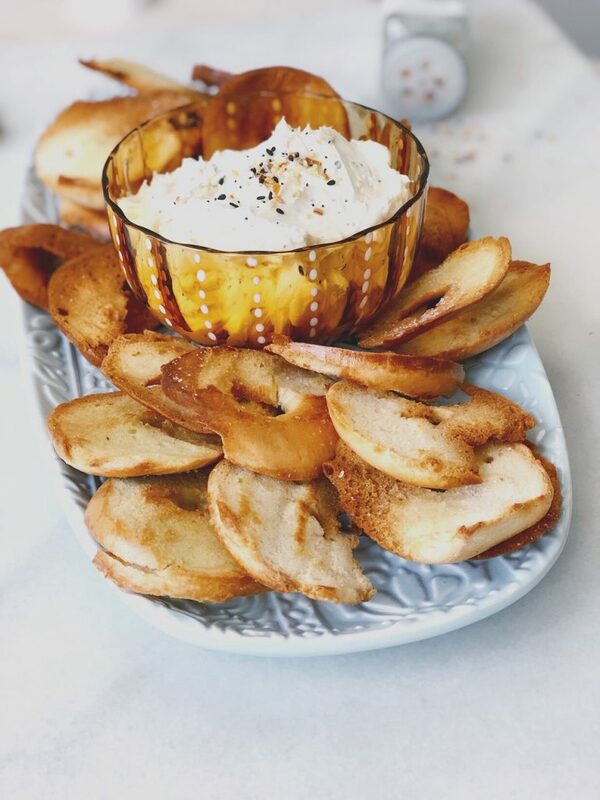 I do have to admit, I’ve never been a fan of store bough bagel chips, so when I was testing these out I wasn’t 100% sure I would like them. I’ve always found store bough to be too crunchy. I wanted these to be like a bagel you accidentally toasted a bit too much, but you could still enjoy. 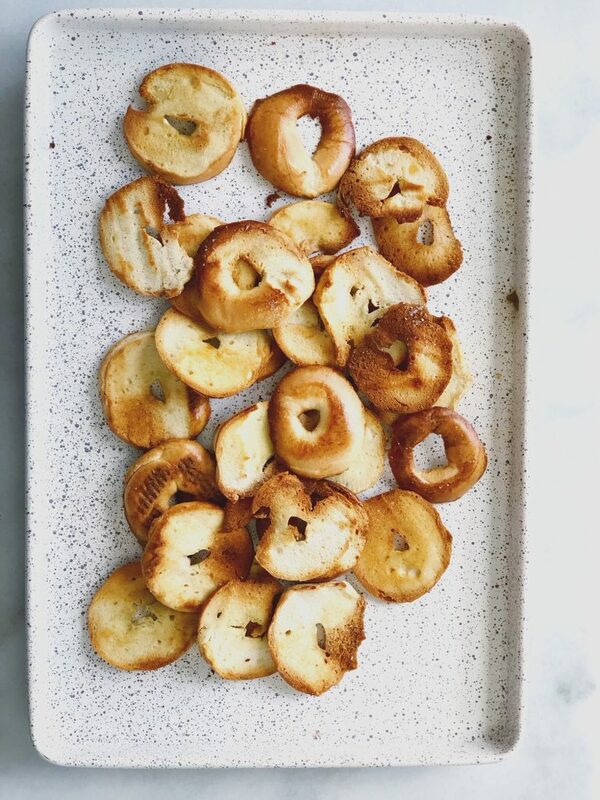 I tried making these a few different ways, and they all came out pretty much the same, so in the recipe I’ve given you all three options: brush with olive oil, melted butter or spray with cooking spray; then you sprinkle salt on them and bake them up until they’re nice and toasted! 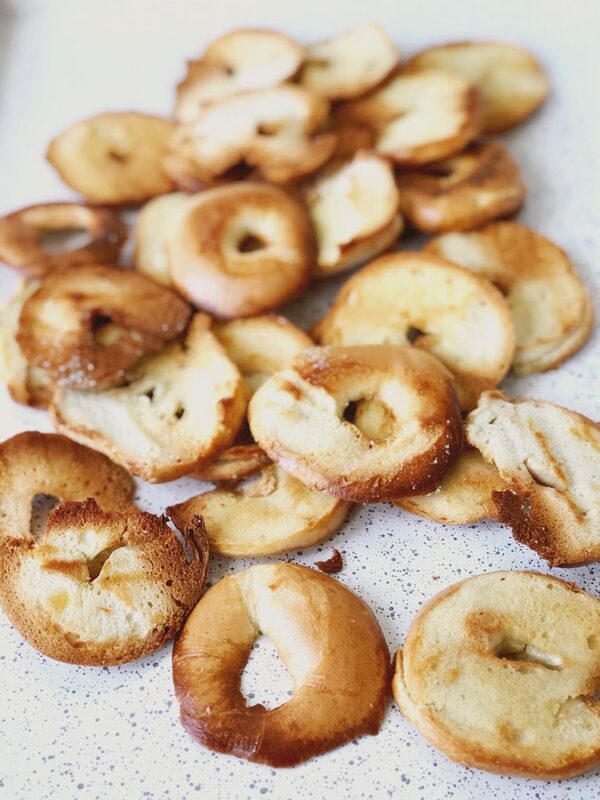 You’ll start with mini bagels – I used Thomas’ pre sliced plain bagels and they worked great! You could try any of the flavors and adjust the dip accordingly. You have to very carefully slice the minis into thin slices, as thin as you can get. Now, the slices won’t be perfect, and they won’t be perfectly even, and you’ll end up trying to slice and then only getting a little piece – that’s okay! The little bits are even crunchier. These were such a hit, and it was nice that some chips were a little thinner than others. They’re homemade, they shouldn’t be perfect! Anyway, the dip is SO easy to make. You take room temperature cream cheese and whip some air into it with a hand held beater or your stand mixer. Then, you pour 1/4 cup of heavy cream into it and whip it all together. Lastly, you dump a whole bunch of TJ Everything Bagel Seasoning, scoop it into a bowl, and enjoy! So stinkin simple! 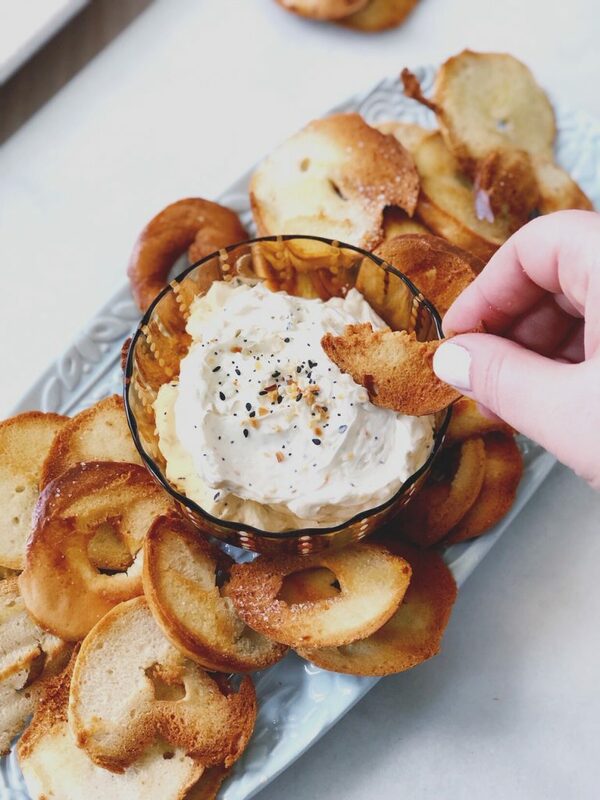 These homemade bagel chips are at least 10x better than store bought! 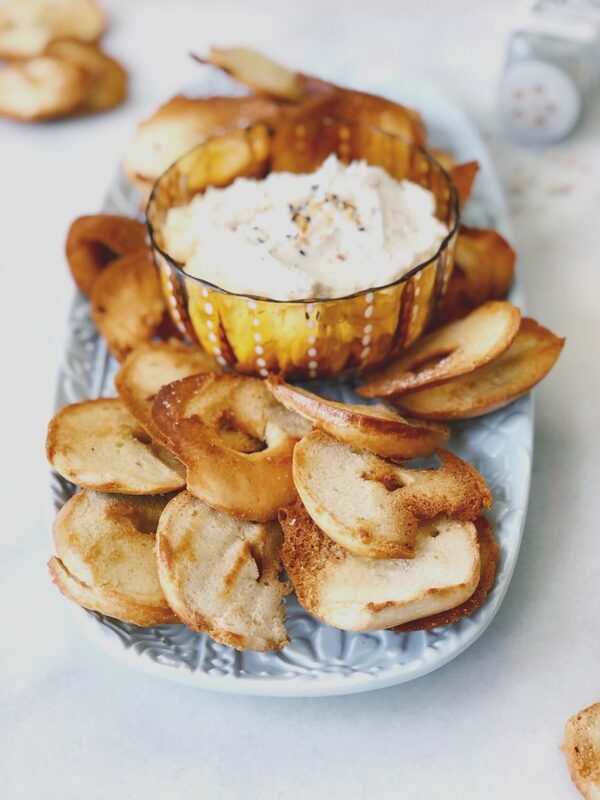 Combined with a cream cheese dip, they’re perfect for brunch! 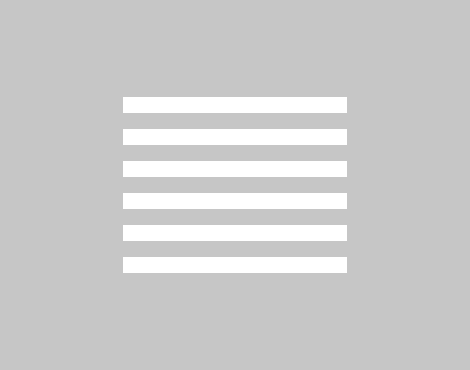 Preheat oven to 375; line baking sheet with silpat or foil sprayed with cooking spray; set aside. Slice bagels carefully. You should be able to get about 5 slices from each bagel. It’s okay to get more or less! Melt the butter, if using. If not, skip to next step. Brush bagel slices, front and back, with olive oil; alternatively, spray the slices lightly front and back with cooking spray. Line bagel slices on baking sheet in an even layer. Bake for about 16 minutes, flipping the chips over at 8 minutes. I recommend starting to check at about 14 minutes of total cook time to see how they’re crisping up – you can then manage how crispy you want them! When done, remove from oven and set aside while you make the dip. In a bowl or in the standmixer, place the brick of softened cream cheese. 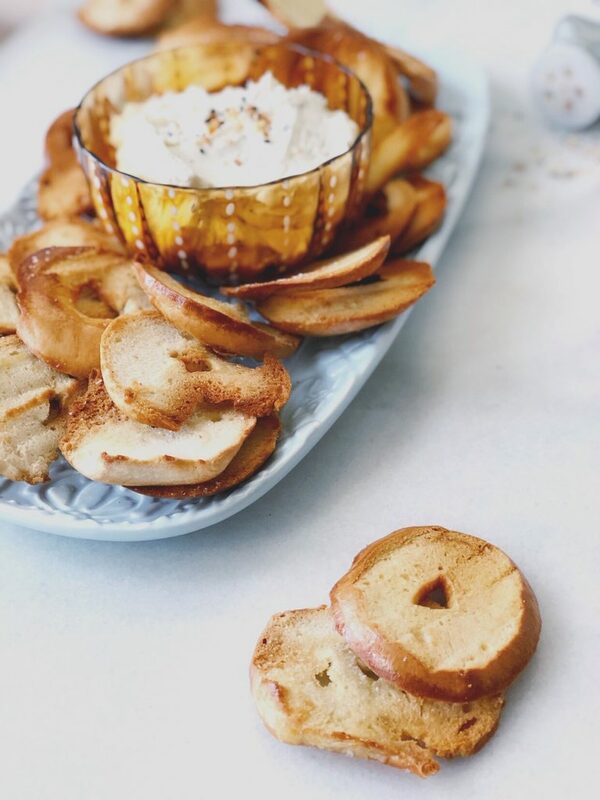 Using a hand held beater or the whisk attachment, whip the cream cheese to get some air into it. When the cream cheese is light and fluffy, add the heavy cream slowly. I used about 3 tbsp, you don’t want the cream cheese to get too wet. 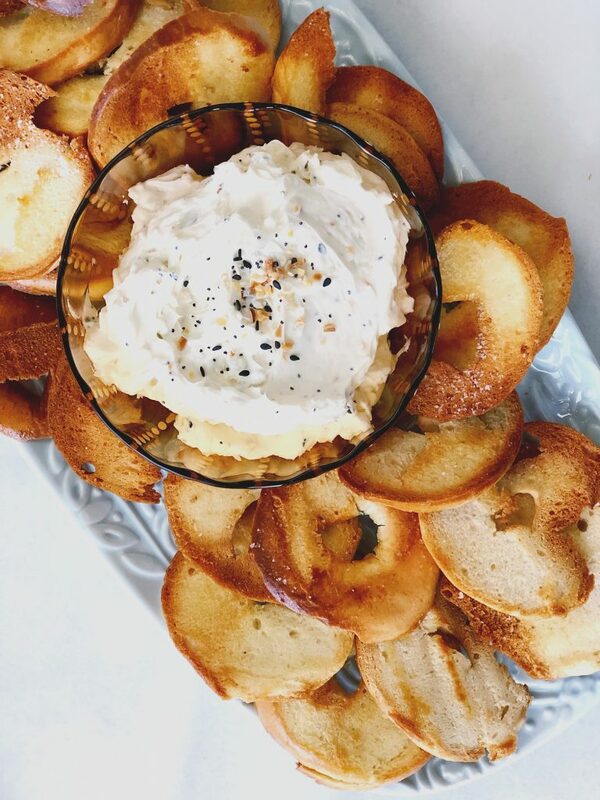 Adding slowly will incorporate the cream to keep the cream cheese soft and airy. 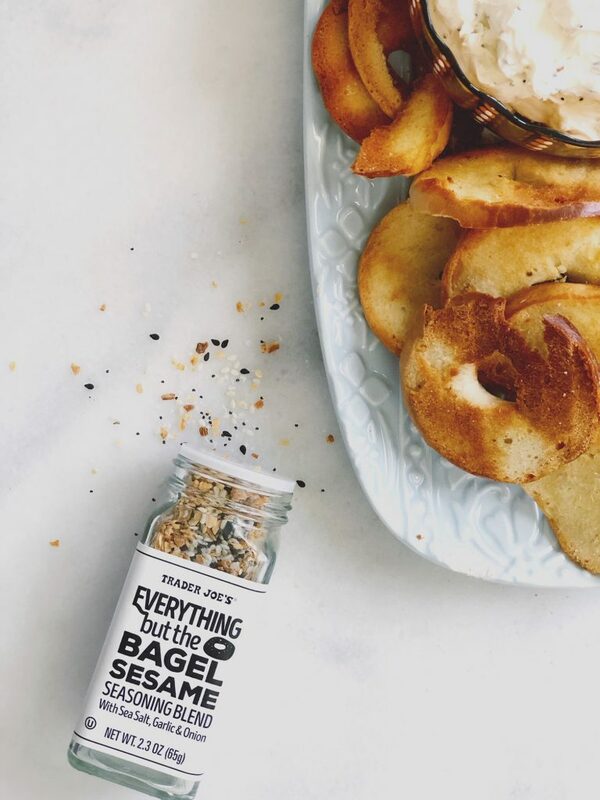 Add 2-4 tbsp of Everything Bagel seasoning, or to your desired taste. Place in a bowl and serve! I was able to get about 5 slices from each bagel, so 10 bagels should give you around 50 chips. Up to you how many you wish to make! I preferred the olive oil chip the best, as it yielded a crunchy yet soft chip; the Pam cooking spray gave me a much crispier (not as much as store bought chips) result; butter was somewhere in between.